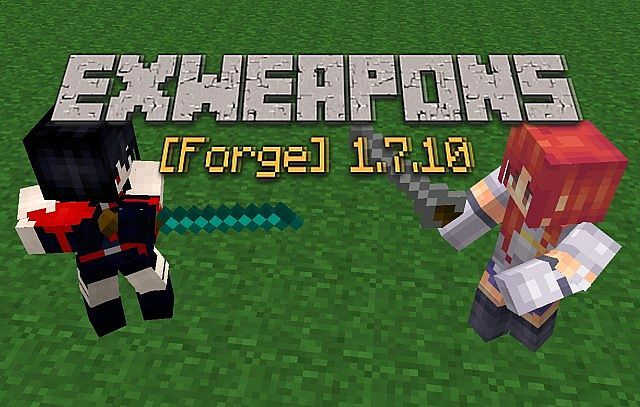 The ExWeapons Mod adds Extra Weapons and Items into Minecraft with 40 new recipes to craft them. There are eight new weapons, and one new item material. The mod is available for Minecraft 1.8 but must be installed with Forge.The developer updates the mod regularly so is a pretty good download as you know it will have more features in the future. To use this modification, you need to first of all download and install it into your Minecraft game. Then load up ExWeapons Mod and craft some of the features in the mod. There are currently no public video showcases highlighting the features of the ExWeapons Mod. The ExWeapons Mod adds in fourty new crafting recipes to create a variety of new weapons. The list of weapons includes the dagger, the katana, the knife, rapier, sai, the battle axe, hammer and scythe. The mod can be installed for the latest patch of Minecraft 1.8, and also works with SMP/Client. Download the latest version of Minecraft Forge by clicking here. Next, download the ExWeapons Mod and drag and drop the contents of the download into the ‘resoucepacks’ folder. Open up Minecraft and enjoy crafting your new bows! The latest update for the ExWeapons Mod made rods cheaper in material to craft. Additionally, the mod also added in two new weapons including the hammer and the scythe. The mod’s developer has set out some clear aims that he wants to reach, to expect many future updates.